My maiden aunt (a wonderfully outdated term, but I think it’s apt when it comes to describing her – she’s 75 and takes life in her very firm stride) recently attended a relative’s wedding. I met up with her a little afterwards for tea at a rose garden, and she had a rather serious criticism to make. Let me first explain that little fazes my aunt. She may not have married and had children but she has spent the greater part of her life teaching children to dance, which she does even in her seventies (although she doesn’t let on as to her age). She is a gifted pedagogue with an incredible way with people. Little shocks her and she seldom complains for the sake of it. In the entire time she spent at this relative’s wedding, not once did the wedding couple come to greet her. They greeted none of their wedding guests formally. My aunt wanted to know from me if this was now the wedding standard? I think what happened at the wedding she described is that the couple did away with the rather out-dated wedding line-up. Which is fine. But they also failed to spend time doing the rounds from table to table, greeting and mingling with guests. Their time was taken up having their pictures taken, and they arrived at the reception barely in time for the first dance. Now, I hate to be a stickler and mention the term ‘etiquette’ at this juncture. But it has to be said. 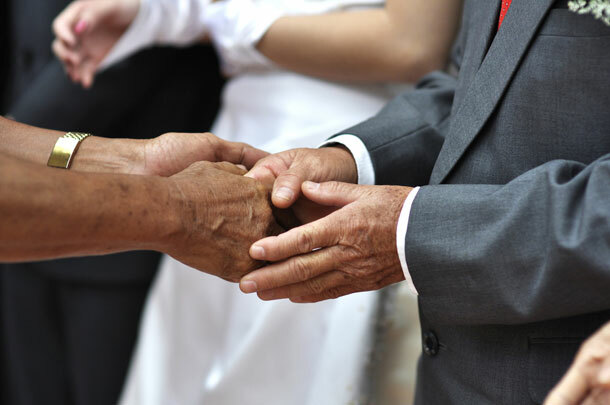 It is the wedding couple’s responsibility to greet and thank each of their wedding guests for attending their wedding. What happens in the process of mingling and thanking is the reason one marries amongst friends and family. Connections are made and reforged, laughter is shared, stories are swopped, and guests feel included – they have, after all, gone to some trouble to be there. An alternative that works well, if you have a small wedding, is to spend each course of the meal at a different table. We had three lots of family tables, and then we moved on to each of our friends tables afterwards.